Since ancient times, the great demon prison Zzyzx has protected the world from the most dangerous servants of darkness, including Gorgrog, the Demon King. After centuries of plotting, the Sphinx is on the verge of recovering the five artifacts necessary to open the legendary prison. Facing the potential of a world-ending calamity, all friends of light must unite in a final effort to thwart the Sphinx s designs and find a safe home for the five artifacts. To this end, Kendra, Seth, and the Knights of the Dawn will venture far beyond the walls of Fablehaven to strange and exotic magical preserves across the globe, where the end of every quest becomes the beginning of another. 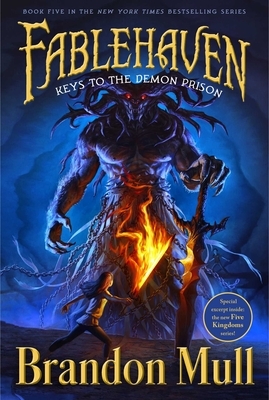 In this explosive series finale, allegiances will be confirmed and secrets revealed as the forces of light and darkness collide in a desperate struggle to control the keys to the demon prison. Brandon Mull is the author of the New York Times, USA TODAY, and Wall Street Journal bestselling Beyonders and Fablehaven series, as well as the bestselling Five Kingdoms, Candy Shop Wars, and Dragonwatch series. He resides in Utah, in a happy little valley near the mouth of a canyon with his wife and four children. Brandon’s greatest regret is that he has but one life to give for Gondor. Brandon Dorman is the illustrator of Be Glad Your Nose is on Your Face and The Wizard, both by Jack Prelutsky; and The Christmas Sweater by Glenn Beck. He received a degree in fine arts from Brigham Young University—Idaho and lives in Puyallup, Washington, with his family.